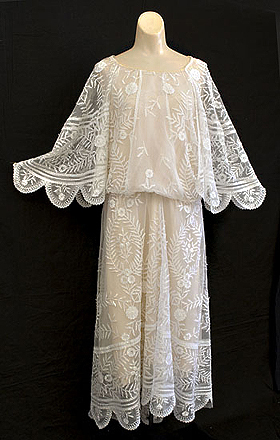 For afternoon or informal evening wear, the 1922 summer Parisian houses were showing many 1920s dresses of organdie, of lace, and of lace combined with chiffon and kindred materials. 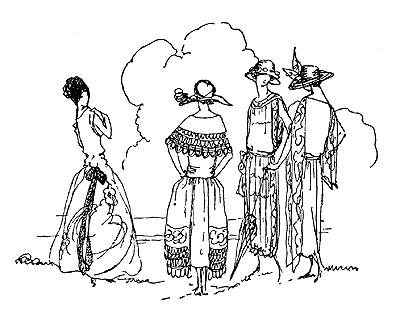 All skirts were long, from four to six inches from the ground, and sleeves were conspicuous by their absence. 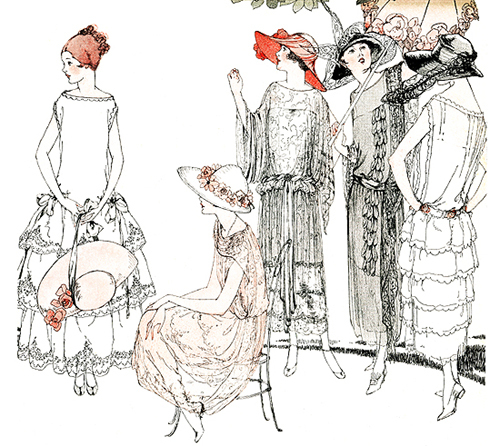 In America, however, women were wearing their "best" frocks about eight inches from the ground, and a sleeve was still considered necessary for daytime. Nothing was lovelier for summer evenings than sheer lace and filmy chiffon. The frock worn by the seated figure above combined these two materials especially well and could be developed in one's most becoming color since lace could be had, or dyed to order, in such a variety of shades. A quaint lace bertha, across the front of the neck only, played at being sleeves before merging into graceful side draperies that gave an uneven hem line. Georgette designed the hat, with its interesting wreath of primroses and dahlias. Almond green lace was lovely over a blue, green and yellow shot taffeta slip, edged with silver, for the good-looking frock in the center above. The sash was of twisted blue and yellow chiffon. The Evelyne Varon hat was crêpe georgette. While the trimming band of yellow satin rose petals was perhaps the newest feature that year of the Rolande dress of yellow chiffon and satin sketched above, the lace sleeves, one falling below the hem of the dress and the other ending at the wrist, were equally smart. The hat of satin and straw lace was from Evelyne Varon. 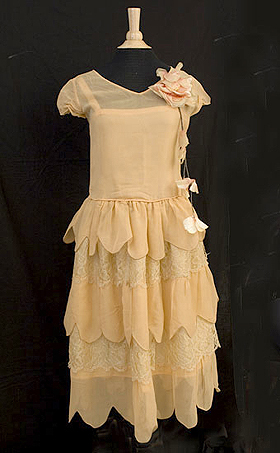 Smart and refreshingly youthful was the sleeveless organdie designed by Molyneux— its only trimmings were embroidered scallops of self material and a fascinating ribbon belt of matching or contrasting color. The georgette hat had an interesting trimming of ostrich. 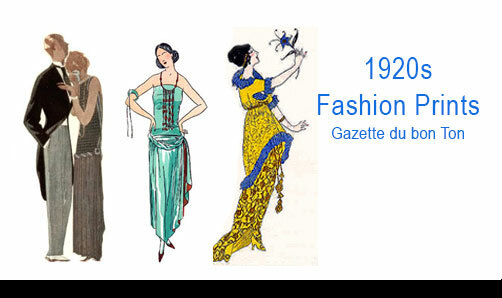 1920s Fashion Prints - Make a Great Gift! In the informal evening frock at the far left, Madeleine and Madeleine combined silk and lace to unusual advantage by the use of a deep collar and shoulder bow and by a hem that sent up narrow panels into the skirt. 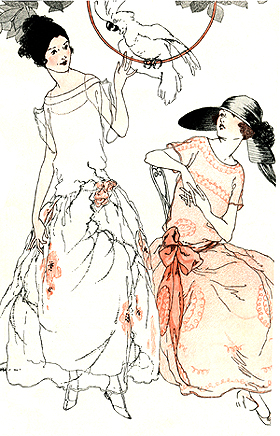 This was also very attractive when the silk were flesh color and the lace beige or copper. Bands of organdie, applied to the edges of the bertha and apron tunic with a simple fagoting stitch, gave distinction to a frock of embroidered organdie designed by Jean Patou. 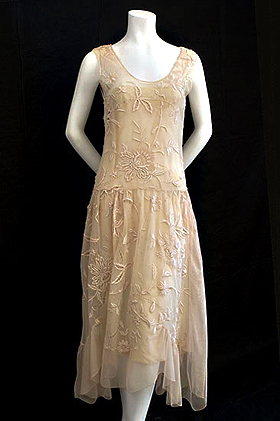 This 1920s dress was equally stunning in black organdie over white or in white over black. Another very charming 1920s organdie dress, shown to the right, from Jean Patou was worn over a silk slip of white or a contrasting color. A delightful possibility was to have both slip and dress of white, a grosgrain ribbon sash of	midnight blue, pink flowers on bodice and sash ends, and the embroidery of pink with splashing branches of black and silver. Very simple and youthful was the organdie frock at the extreme right, with its sash of crisp taffeta. This was attractive in almost any color or combination of colors. Georgette designed the smart, oddly shaped hat of black straw.